The Nikon 16-85mm lens was introduced on 29-January-2008 — read the press release. Download the Nikon 16-85mm VR Manual (PDF link). In this long-term review of the Nikon D7100, DC Watch at Impress posted up several full-resolution photos taken with the 16-85 VR lens. Other lenses used were the Nikon 60mm f/2.8G AF-S Micro-NIKKOR and Nikon 28-300mm f/3.5-5.6G ED VR. Nikon 18-55mm VR vs Nikon 16-85mm VR on the Nikon D7000 — Full-resolution sample photos at Impress. Bernard Tan has shared some impressive photos, which did not go through any post-processing, save for resizing for the web and inclusion of a copyright stamp and major EXIF data. The full EXIF is retained in the images, so you’ll only need to download them and open the files up in Nikon ViewNX or Nikon Capture NX2 (a free trial is available) to see what settings Bernard used for the shots (hint: Manual mode, Active D-Lighting On (Auto), [SD] Standard picture control, Saturation +1). The re-sized ISO1600 and ISO 3200 (handheld) shots look great too. The pictures were taken with the 16-85mm mounted on a Nikon D5000. You might want to look up further information on the Marina Barrage. “LordGriNz” shared a series of beautiful photos from that trip. Most of the pics were taken with the Nikon 16-85, while the night shots were taken with the new Nikon 50mm f/1.4G AF-S lens. Camera used was the Nikon D40X. I don’t understand Japanese, but the 16-85 images posted on this site are quite useful for analysis. 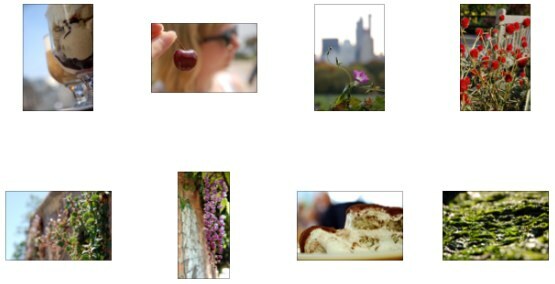 Twelve samples on this page, all taken with a [Nikon D300](/nikon-d300/). There’s also a photo of the lens mounted on the D300. The landscape photo was shot at 16mm and f/14 — the sharpness and detail across the frame is admirable. Bokeh in the flower close-ups taken at 85mm is very good. On the review comparing the D300, D700 and D3, there is a series of photos of a building taken with the 16-85mm mounted on a D300. Here are the direct links to the 16mm, ISO 200 photos at f/4, f/5.6 and f/8. Bear in mind that the amount of barrel distortion at 16mm makes the 16-85mm unsuitable for critical architectural work, but I like the overall sharpness I see in the images shot with this lens. David Kilpatrick put up this comparison gallery pitting both lenses in a typical “walkabout” photography session. The 16-85mm was mounted on a Nikon D60 while the CZ 16-80mm lens was mounted on a Sony A200. This 16mm urban image by Allon Kira of some gentlemen having a drink outside a barber shop is an example of the kind of photos this focal length is good at capturing. Another stunning 16mm photo by Allon is this one of a boy and his mule. Examples of closeup photos with the 16-85mm VR Nikkor — Heulwen shot these with the Nikon D50, and made it clear that the lens is not suited for true close-up images as it cannot focus as close to the subject as one would expect. For greater magnification, Tierce fit a Marumi 72mm DHG (Digital High Grade) Achromat Macro 330 +3 filter on the front of the 16-85mm lens. He shares four examples of close-up photos of a hoverfly and flowers taken with this combination. 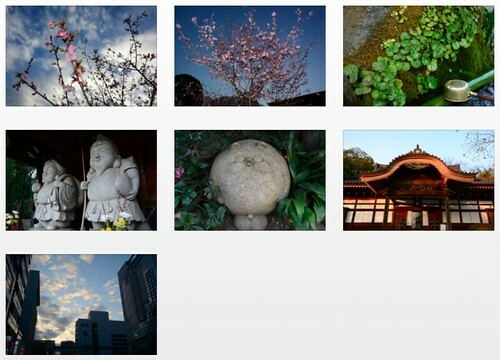 Full-resolution Nikon D300S plus Nikkor 16-85mm review sample photos at DC.Watch. Here’s Google’s English translation. As usual, Thom has written an excellent review for the Nikon 16-85mm. The lens earns an impressive 4 stars for features, performance, build quality and value. I personally value those extra 7 degrees at the wide end much more than the extra 6 to 9 degrees at the telephoto end—they make a more dramatic impact on my photography. In a forum post, Thom confirms that on average, the 16-85 would get 4 stars, while the 18-200 gets 3. Nikon has produced a lot of good consumer zooms, and the 16-85mm is another of them. Unlike some of the others, it doesn’t have any particular weakness that stands out. As you might expect, 16mm is the weakest focal length, but it’s still very good overall. By 24mm the lens is excellent in almost every respect. At the telephoto end the lens is also mostly excellent. Overall, I wouldn’t be afraid to use this lens at any of its settings. Very useful wide angle ability. Very good overall with no significant optical faults. Read also: Nikon 16-85mm vs Nikon 18-105mm – Thom Hogan’s opinion. 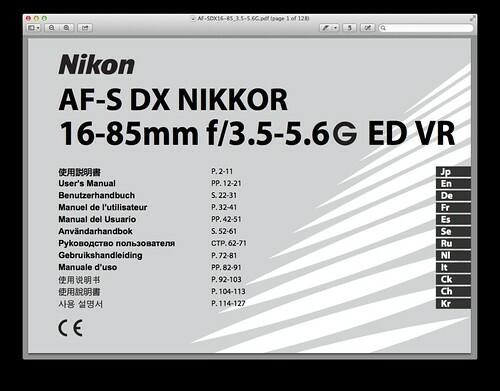 Despite some shortcomings the Nikkor AF-S 16-85mm f/3.5-5.6G ED VR DX is probably still the best DX standard zoom lens in Nikon mount to date. Refer to the MTF (resolution) section for suggestions on the lens’ sweet spot, focal length and apertures to use for the best sharpness. 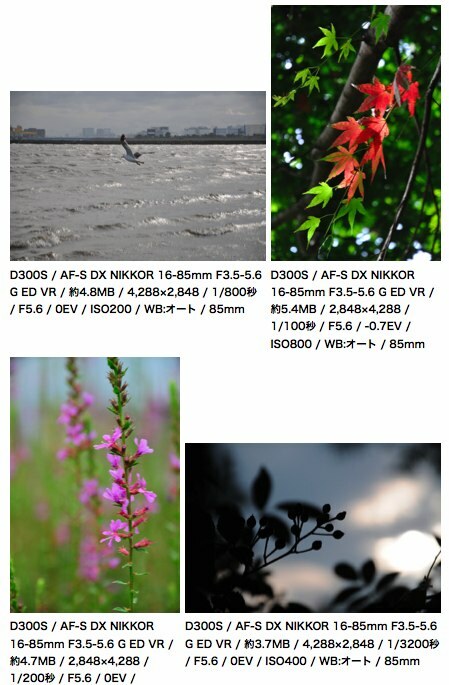 On the same page, bokeh is found to be rather pleasing at 85mm and f/5.6, but much less so at 50mm and f/5. There are two sections on this page, the professional review by Andrew Alexander, as well as user feedback on the Nikkor 16-85mm. The 16-85mm ƒ/3.5-5.6 is an admirable lens; excellent sharpness and chromatic aberration results, marred only by some distortion and vignetting issues. With the release of the 16-85mm ƒ/3.5-5.6, the bar has been raised. There’s also a full-sized, studio test photo taken at various focal lengths and aperture values. The user feedback section also has some great comments. The one by “ppk” compares the 16-85 with three other Nikon lenses, the Nikon 35-70mm f/2.8D, Nikon 18-135mm and the 24-85mm (I wasn’t able to determine if he meant the Nikon 24-85mm f/2.8-4.0D or the Nikon 24-85mm f/3.5-4.5G). In this post, Mecc says that the 16-85 produces sharp pictures if you use f/4.5 to f/11 for the 16mm to 70mm focal length range. From 70mm to 85mm, it’s best to use f/8 to f/11. He also adds that it’s advisable to wait for up to half a second after half-pressing the shutter for the VR (vibration reduction) mechanism to stabilize. Mike Neary says that the 16-85mm is every bit as sharp as his Sigma lens. Several owner opinions on Amazon highlighted the fact that the barrel on the 16-85 does not creep like the Nikon 18-200mm VR lens when pointed at an angle. In a thread discussing both lenses, MagicNikon says that after owning three copies of the 17-55 with “spotty focusing issues”, he’d finally decided to get the 16-85 instead, and is happy with the lens. MagicNikon’s also posted a 16-85 photo of a “Jousting Knight” on DPReview that I like very much. Alan finds that the 16-85 has the better build quality, and the VR “really works”. This discussion started with a question by a Nikon D90 owner on which was the better “walkabout” lens. I’ll summarize some of the points brought up in the replies. Intrepid24’s strives to maximize depth of field (DOF) when he shoots at the wide end, and his 17-55 lens was replaced with the 16-85mm. The extensive DOF and lack of field curvature distortion at the wide end are huge plusses for shooting landscapes. The VR assist helps a lot when shooting indoors in museums and churches. Intrepid24 also points out that the 16-85mm is the only lens from Nikon to offer VR in the 16mm and 17mm focal lengths. Riccardo Polini reports that at f/8 and 50mm, he couldn’t detect any differences in image quality between the two lenses. At f/5.6 however, the 16-85mm shows slight softness in the corners. “seguetester” started this thread asking for opinions on which lens to get. He’s compiled a pretty good list of pros and cons of each lens. Having owned the Nikon 18-200, I would have to agree with ThomasMiller’s advice (Alan concurs, and owns both lenses) that there’s not much difference in terms of image quality between the two. You alone can decide whether you’d prefer the wider perspective on the 16-85mm, or the longer reach on the 18-200. The zoom range on the 18-200 was invaluable on a recent family vacation — I used up all of it. The 16-85 VR accepts filters with 67mm thread size, which means you’ll want to be looking at purchasing 67mm filters. Nikon also makes their own filters, namely 67mm Circular Polarizer II, 67mm Screw-On Soft Focus Filter and 67mm Screw-On NC (Neutral Color) Filter. The full list of compatible accessories is available at Nikon USA and in the manual. 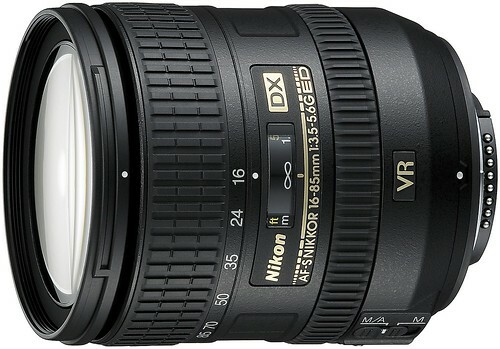 Nikon AF-S DX Nikkor 16-85mm f/3.5-5.6G ED VR press release on DPReview. Nikon Lenses — Main page.